Libraries are among our fastest growing client segment. That is not a surprise to us. Libraries are an integral part of the growing national and international Dementia Friendly movement. The movement started in the UK but is gathering steam in the US. The Dementia Friendly movement operates on the principle that people can live well with dementia. The movement’s goal is to erase the stigma surrounding this condition. Its strategy is to help create communities that are supportive of people who have dementia; in other words, communities in which this special group can feel like welcome and productive members. There are a number of ways that a library can be more accessible to people with dementia, including selecting materials and creating programs that support them. Holly and I had the good fortune to speak to a group from the Northeast Ohio Regional Library System about just this. The Systems conference was held in Twinsburg last week (April 4) and hosted about 150 attendees from all over northeastern Ohio. The theme of the conference was Mental Health Awareness: Libraries Create Safe Zones for Customers and Staff. The purpose was to help library staff understand and work with special problems and situations they might encounter with library patrons with a mental illness. We were invited to speak about making libraries dementia friendly. 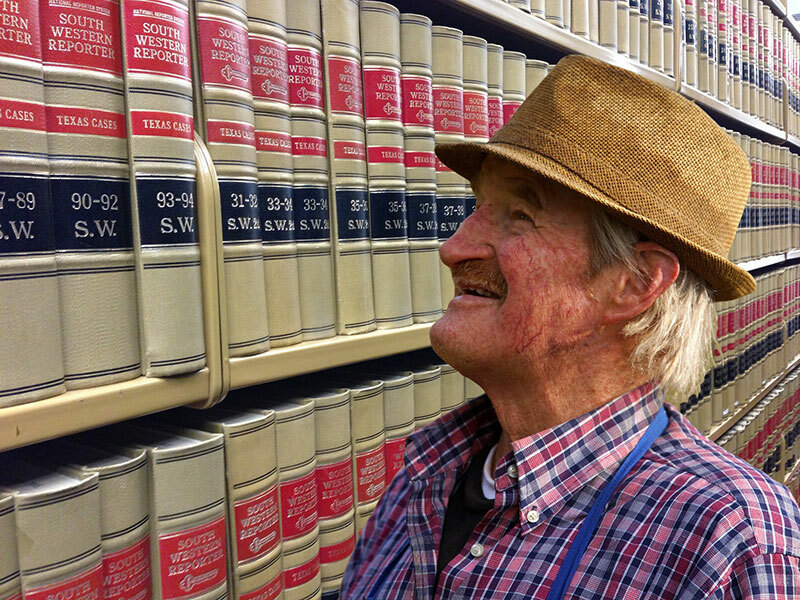 Dementia will make it difficult for this man to understand these law books. However, if he practiced law, he will likely get enjoyment from looking at and perusing them, even if he can’t read or understand the content. Dementia was not on the NAMI list of mental illnesses, but their talk got me thinking. In my writing I have never characterized dementia as a mental illness, but it really is. It certainly fits the above definition. While listening to the ladies from NAMI I made some quick mental edits to include this observation to my own presentation, which came after lunch. Briefly, Holly and I talked about some of the special considerations that are required to make a library truly dementia friendly. Dementia can cause a host of perceptual and navigation problems. One of the first things is to ensure there are no physical impediments or restrictions in the building itself. Lighting should be bright but not glaring. Entrances, exits, bathrooms, etc. should be clearly marked. We referred them to our website to learn more about how dementia can affect perception, navigation, and other cognitive processes, as well as important considerations when designing and decorating for people with dementia. It helps to know how many people in a given population have dementia. Do you know how many people there are in your community with dementia? A quick way to get a fairly close approximation is to multiply your population by 0.02. About 2% of any US population has dementia or another dementia. We also stressed that people with Alzheimer’s disease and most other forms of dementia will have various problems with communication. We introduced some of the things that can be done to make communication more meaningful. Again, we referenced our website for a more detailed discussion about communicating with someone with dementia. The more you know about dementia and the effects that it can have, the better prepared you will be to work with people who have dementia. For example, one little known symptom of Alzheimer’s disease and many other forms of dementia is a loss of initiative. There is an area in the front of the brain that prompts one to initiate an act; to choose something to wear, fry an egg, ask someone for help. When this part of the brain is damaged it becomes difficult for someone to make even a simple choice, like the choice to pick up and open a book. You might have to make that choice for them to get things started. Continue that process until you find something that clicks with that individual. In addition to providing appropriate material and activities for people with dementia, your library can host speakers and professionals to help families who are caring for loved ones. You might even have programs for those with dementia along with their caregivers. On this website you will find help to better understand dementia, how it effects the individual, and ways to better communicate with people who have dementia regardless of the cause. Books and activities available for patrons with dementia should be both age- and stage-appropriate. That is, you should consider that these people are older and may not appreciate a puzzle that was designed for a young child. However, an activity that is too difficult will only frustrate. Read more» about age- and stage-appropriate activities here. And when you are ready, find books and activities and things we recommend to help make your library dementia friendly at our store.